One of my very favorite quotes is, "I took a walk in the woods and came out taller than the trees" by Henry David Thoreau. These words continue to resonate in the deepest parts of my heart and soul like they did on the very day this cherished memory was made with my Father back in October 2014 at Shubie Park, Nova Scotia. 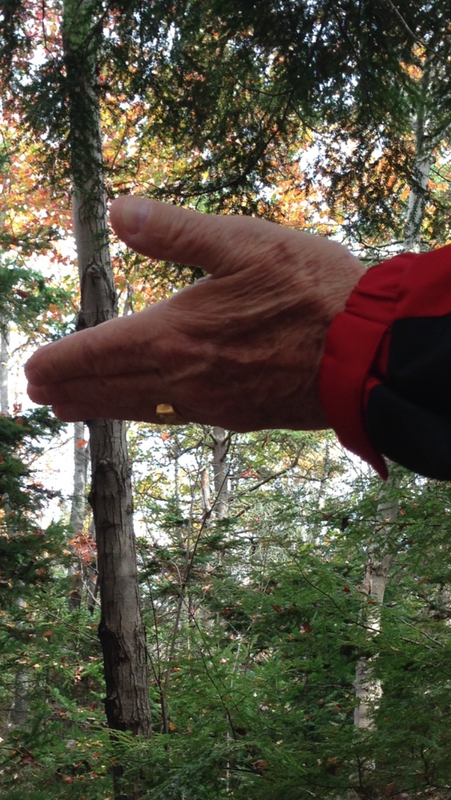 The gentle hand that you see reaching out to feed this trusting Chickadee is that of my Father who is now sadly in the very final stages of his Alzheimer's Disease. You see, My Father loved nature and had a passion for photography and my time spent with him throughout the progression of his disease when I would travel back home to Nova Scotia is and forever will be priceless. Every day we would plan a different "outing" and just get in the car and go exploring. No matter where we went or where we ended up it was always an adventure filled with cherished memories and insight into the wonderful man that I lovingly call Dad. Compassion, kindness and learning how to appreciate the beauty and splendor in everything where just a few of the attributes and invaluable lessons that my Dad bestowed on to me. So when I went anywhere with my Dad whether it be into the woods, Point Pleasant Park, Peggy's Cove or the Halifax Waterfront, I would always return home a more insightful and enlightened human being.